I don't usually have afternoon tea. My kids do. That's because I live my life around my kids' schedule. We have late lunches and early dinners. They won't be home from school before 1.30pm and we have to have dinner before 7 in the evening as bedtime is just a couple of hours away. As a result, I don't have any desire for food in the late afternoon, but my kids would usually be stealing some time snacking away at the dinning table. My elder child is that sort of person 'who lives in his own world'...but when it comes to tea-break time, he will automatically get out of his world and go hunt for food. He will ask his brother along. Besides food, you need good company to enjoy your tea time. It is the time they would share stories on the latest happenings in school, comparing whose teacher is stricter, and talking nonsense such as making fun of teachers hairstyles or names. They can talk just about anything under the sun...from jabulani ball to debating whether they should play English or Chinese chess in the evening. I don't usually have afternoon tea since I don't have good company. My two rascals don't count. However, there is always an exception. For instant, I can't resist but to make myself a cup of tea to go with a slice of this wholesome homemade cake. Will you be surprised if I were to confess that this Banana Walnut Cake happens to fall under the category of those 'haphazardly-made' cakes? I have craved for scones, and have intended to make some, but I changed my mind halfway through measuring up the ingredients. My cravings has suddenly switched from scones to a slice of fruit pastry cake. I thought I could use up the leftover peaches to make the cake, but only to realise that I didn't have any yoghurt or sour cream that's called for in the recipe. I turned around and spotted a bunch of over-ripe bananas...all covered with speckles. My problem was solved. I threw in some mashed bananas and chopped walnuts in the batter and transformed the fruit pastry cake into a banana walnut cake. This cake is so easy to make that I have nothing to share with you on the preparation process! The finished cake has far exceeded my expectations. This banana version tastes as good even without the use of yoghurt or sour cream. I guess nothing could ever go wrong baking with bananas. The walnuts lends an interesting texture to the soft, tender crumbs and I super-love the banana fragrant. While the cake was baking in the oven, my whole kitchen smelt as though I was frying a wok full of goreng pisang (banana fritters...deep fried bananas coated with batter). The cake tastes a little sweet though, and that is mainly due to the sweet bananas. On hindsight, I should have replaced some of the plain flour with wholemeal ones, besides the additional fibre, I'm sure I will like the extra nutty texture. So, that was how I ended up enjoying my slice of cake with a cup of lemon tea, on a cool late afternoon. Grease (with butter) and flour the sides of an 8" or 9" round pan and line the base with parchment paper. With an electric mixer or a manual whisk, cream butter and sugar till light and fluffy. Add vanilla extract and mashed bananas. Mix till smooth. Sieve over flour and baking powder and mix till smooth. Add chopped walnuts (reserve some for sprinkling the top, optional). Mix with a spatula. Pour batter into prepared pan and smooth out the top with the spatula. Sprinkle the top with the remaining walnuts or arrange some banana slices (dipped in some lemon juice to prevent it from turning black) on top. Bake in pre-heat oven at 180degC for 60 minutes or until a skewer comes out clean when inserted into the cake. Leave the cake to cool in the pan for about 5~10 mins. Unmold and transfer to wire rack to let cool completely. This looks really, really good! Thanks for sharing the recipe! Just like to check with you what kind of bananas do you always use for banana cakes? I ve always used my left over delmonte bananas, until once I switched to another kind of bananas,dunno what's the name, but should be the extra sweet kind,"phang jio". It yielded a sweeter, more fragrant cake as compared to the delmonte kind. Very nice banana walnut cake HHB, I would like to have some nice cakes for my tea break too, but eating alone really bores me. Longing to have tea with my old buddies, but everyone is so busy with their daily schedule. It really sounded like me in the kitchen. Always 'so spur of the moment' situation. Like your article - wish my girl is as interesting as your kids. She's too serious for company. oh yums! subsituting ingredients last minute takes alot of guts! LOLz. I love this combination! Wow your meal time is very close to mine! Çok leziz ve iştah açıcı olmuş ellerinize sağlık. you are a baking master, you can just grap whatever you have and bake a nice cake, look really tempting! Ya, I saw your comment in Kitchen corner about the egg yolks, at the same time i also saw Angie made a strawberry mousse, but she use marshmallow, maybe you can create one without egg yolks, refer her post here-http://angiesrecipes.blogspot.com/2010/07/vanilla-yogurt-mousse-with-strawberry.html, hope this helps. Hi Cupcakes, I've tried using both too, but I can't remember whether there is any difference. Will certainly take note of it next time. hi chun, there are some cakes which doesn't require an oven...eg steamed cakes! Some cakes (eg chiffon cake) can even be 'baked' with a wok. ReeseKitchen, I wish we can have a 'cyber' afternoon tea together ;) I am in the same boat, everyone seems to be busy, except SAHMs, lolz! experimentalcook, my elder child is a very serious kid too! He is very shy. It is only when his younger brother is around, he is more open up and more cheerful and playful. edith, I believe you also plan your day around your kids' schedule. btw, I am planning to make your rice cooker chicken...I think I have finally come up with a meal plan. I only have one rice cooker, if I use it to make the chicken, I will not be able to cook rice as it takes 45mins for the rice to cook, the chicken will be cold by then. It was only yesterday that I came up with this idea...cook the rice first and use it for fried rice while the chicken is in the rice cooker, hope it works, wish me luck! Many thanks for yet another yummilicious recipe of yours. I have been a big fan of yours - been logging your blog and tried your recipes last year when i was based in germany. keep up the good work! have you baked cinnamon rolls lately? I saw from the side bar that you have uploaded into flickr..can please share your experience and great photos with us? Just went grocery shopping yesterday and bought bananas, lemon, yogurt, almond, mmmm still thinking of what cake to bake out of these? Tammy, thanks for following my blog :) I hope I can post the cinnamon roll soon. Quizzine, I will for you to post up your cake, I am sure it will be something real nice! Bee Bee, I always replendish my stock of walnuts, besides using it for baking, I also use it to make granola or toss them in salads, or just eat it on its own as snacks. HHB, lovely write-up! I enjoyed reading it! Short and nice, which is unlike mine, TOO long-winded. LOL! Your whole kitchen smells like pisang goreng!? Serious!? OK, I can foresee another HHB fever in the SG-MY food blogosphere. LOL! VERY soon ... Your fruit pastry cake is everywhere!! LOL! Btw, I love how you described the two siblings ... How they interact with each other as they grow up. I just wish I can fight less with my own siblings ... Maybe we're a bunch of aggressive nerds ... Haha! How I wish I can stay near u, then I can have a good afternoon tea with you. :) Me too, I'm always looking for mousse and ice cream recipes without egg yolks. I'm probably worse than you, cos I need mousse recipes without gelatine too. That's why I have never made mousse cake. I totally agree with Cook.Bake.Love that your boys always have 口福!! I love banana & walnut. I love afternoon tea :-) Banana and walnut are definitely delicious together! Hi HHB, I just baked a Banana Walnut Cake using the recipe you have provided. It was my maiden attempt at baking cakes and surprisingly, it turned out to be really good! :) I am encouraged. Thank you for being an inspiration to my baking endeavour. Cheers! Hi Erith, glad to know that this recipe turn out well :) I just read your blog, love your writing! Amazing recipes and photos.No words to explain your interest and dedication.Mam, please post Lightening Mcqueen cake with cream decoration. Hi, when u state mix till smooth, may i know what consistency should it be? For example, must it be mixed till ribbon like (stiff peaks)? Like when u beat egg the ribbon like kind of texture? Hi, you just need to mix till the flour incorporates into the batter, there is no need to beat till ribbon like. If you are using a spatula, just a few quick stir will do. Thanks for sharing the recipe. 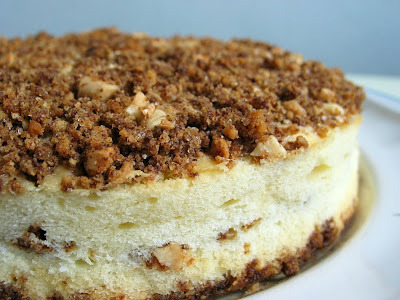 I tried baking this cake and it taste really nice especially with the crunchy walnuts! However, I thought my cake was bait moist. Any tips on how to make the cake abit lighter and fluffier? Is that suppose to be the texture? Hi, not sure whether the denseness was due to under baking? If not, the only way to make it lighter is to make sure you cream the butter and sugar till the mixture turns pale and fluffy...to allow air to be incorporated into the batter. The mixture should look light pale and has 'volume'...it shouldn't be greasy like mayonnaise. If the mixture looks greasy, you may have let the butter melted. Hope you know what I mean? Thanks for the receipe, it's my 1st attempt yday but found the following mistakes. Needs ur kind advice on how to overcome it. Hehe. 1) Top of cake is hardened, top walnuts slightly burnt, I followed your recommended temp of 180 deg C (using oven thermometer) ard 40mins. 2) The cake doesn't raise much except the center portion up by ard 1 to 2 cm only. 3) During the beating of butter and sugar, do I need to beat for very long? Also how for the butter at room temperature meaning is it still in solid form but easy to cut? 1) maybe you can bake it at a lower rack? or cut down the baking time by 5 - 10 mins. As every oven works differently, you will need to get to know how your oven and adjust the temp/time according. If the walnuts appears to get overly browned but the cake is still not cooked, you can cover the top with a piece of alum foil to prevent it from getting burnt. 2) not sure what happened, could it be due to the beating of the butter and sugar? can i use self raising flour? if so, do I still need baking powder? I followed this recipe today - it is delicious! Thank you! Can I use top flour instead of plain flour? Hi New baker, you can use top flour. I have just tried this... and it was so moist and aromatic ... definitely a keeper!